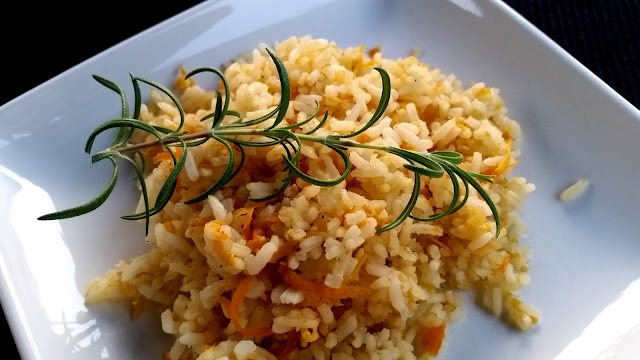 This rice dish smells wonderful as it's cooking, it's fragrance lingers in the kitchen. It is a tasty side dish to serve with fish. Leftovers are delicious reheated the next day. Combine rice and water in a medium saucepan and bring to boil over high heat. Reduce to low heat, cover and allow to cook until tender. It was done at 18 minutes. While rice is cooking melt butter in skillet on medium heat. Stir in ginger and carrots, cover and allow to cook until carrots are tender. Stir in salt, cayenne pepper, and ground peanuts. what a lovely combo! I'm making this today! I can almost smell this - sounds absolutely wonderful Betty! This sounds wonderful, I am making it tonight! we just harvested carrots. good timing.